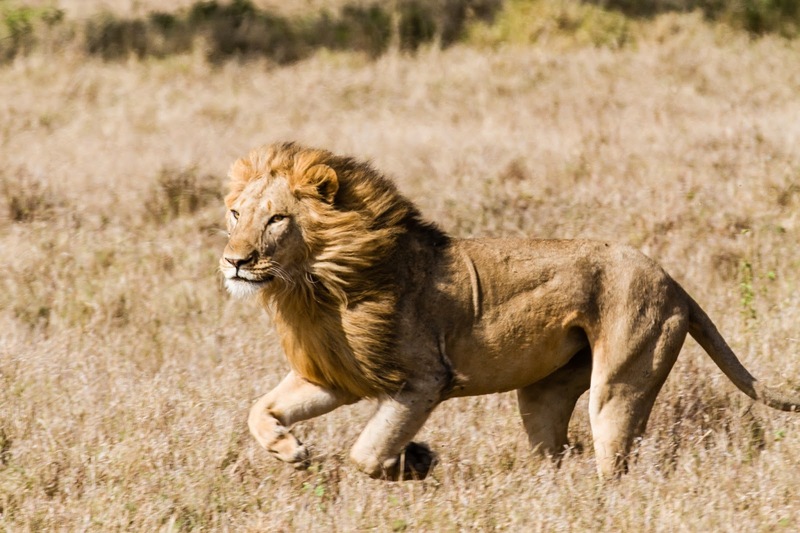 Seeing a predator make ‘a kill’ is often high on the wish list of safari-goers. Managing these lofty expectations is a major part of a guide’s job, especially important during the guest briefings prior to an activity. Teaching and practicing such briefings is a big part of any Ecotraining course, just as it was on the 28-day Safari Guide Course we ran on Kenya’s Lewa Wildlife Conservancy in August this year. After all, it helps a guide develop rapport, communicating safety and ethical considerations as well as giving the guide a chance to deliver a realistic yet hopefully wonderful experience. However, before the instruction could even begin, I, as instructor, took on the role of guide and had to do the usual expectation management when the typical ‘kill request’ came up. With a more reasonable perspective, the request didn’t come up again on later drives, although I knew that the students were just as secretly hopeful as I was about seeing such an event. We were driving back to camp after another successful morning practical guiding activity. It was around 9:30 and all our layers for the chill of dawn were peeled off, the temperature was climbing rapidly and sunscreen had already been applied at our coffee break an hour earlier. Our camp came into view as we entered the grove of fever trees (Vachellia xanthaphloea) that marked the edge of the main Lewa swamp. Sure enough, the keen eyed student had spotted a blonde-maned lion making a steady march towards the swamp, about 50m away from us. We slowed to stay parallel with him. Suddenly, he broke out in a trot. Looking ahead in the direction of his determined stare, we could see what had grabbed his attention. Around 250m in front of him was a herd of Defassa Waterbuck (Kobus ellipsiprymnus defassa) and two Grevy’s Zebra (Equus Grevyi) stallions that were embroiled in a full-on territorial fight. Unlike their Plains Zebra cousins, the Grevy’s are territorial with a totally different social structure – they also don’t hold harems like the much smaller, non-territorial, Plains Zebras. 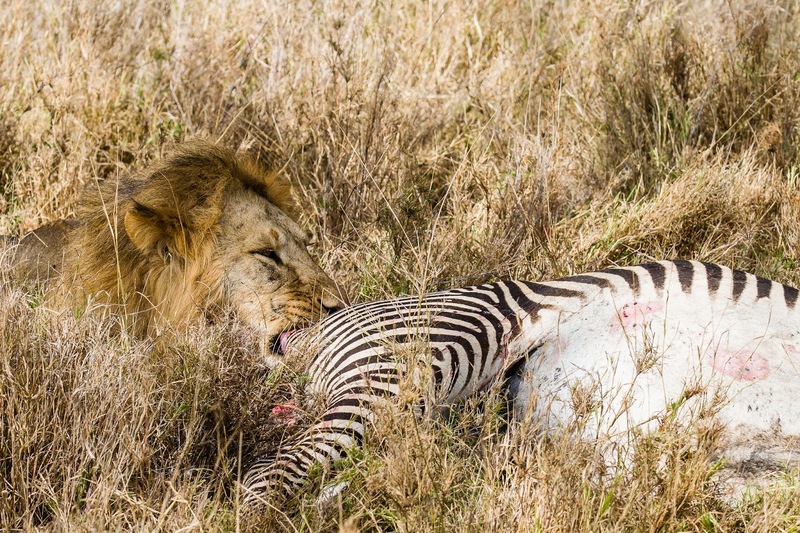 Now within 75m of the Zebras, the lion used a large lone fever tree to hide his final sprint. It was only when he was less than a few metres away that the stallions seemed to realize the danger. They separated, the lion seemed to stop, as if to pick his target, and pounced on one of their backs. All of us gasped. “Go, go, go!” I urged. ‘Silke’, our guide for the day, moved the vehicle to a spot parallel to the struggle, which was happening less than 30m from the road. The lion manoeuvred into a position where he could hang off the stallion’s neck with his jaws and front paws, trying to pull him down to ground. The Zebra, over twice the lion’s weight, did his best to stay on his feet. This fight was not over. 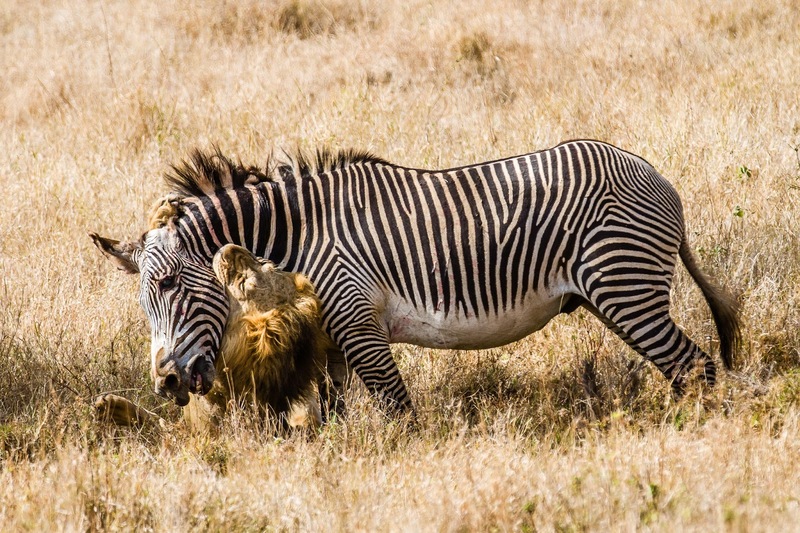 Their bulk, powerful kicks and vicious bites are usually enough to deter lone lions from hunting adult Grevy’s Zebra stallions. But again, there was nothing ‘typical’ about this hunt. 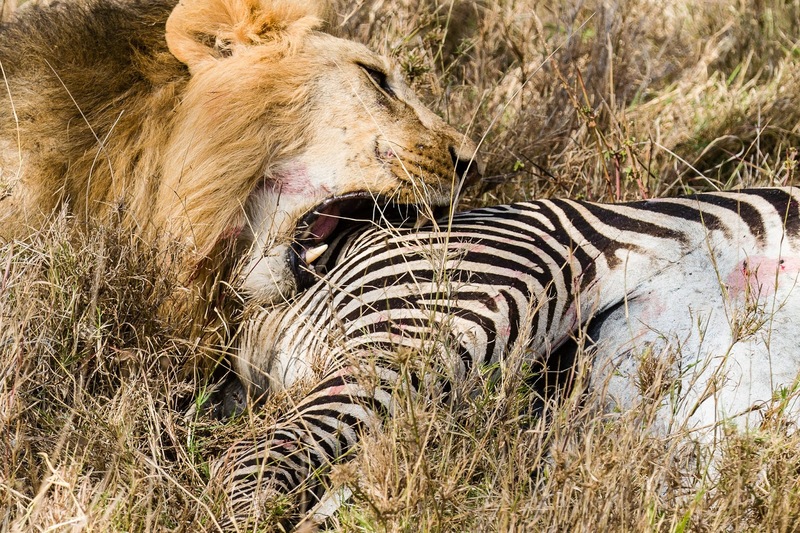 After approximately four minutes, the Zebra collapsed and the lion adjusted to finish suffocating him. It took another three or four minutes before the twitching and kicking stopped and the lion sensed he had succeeded. 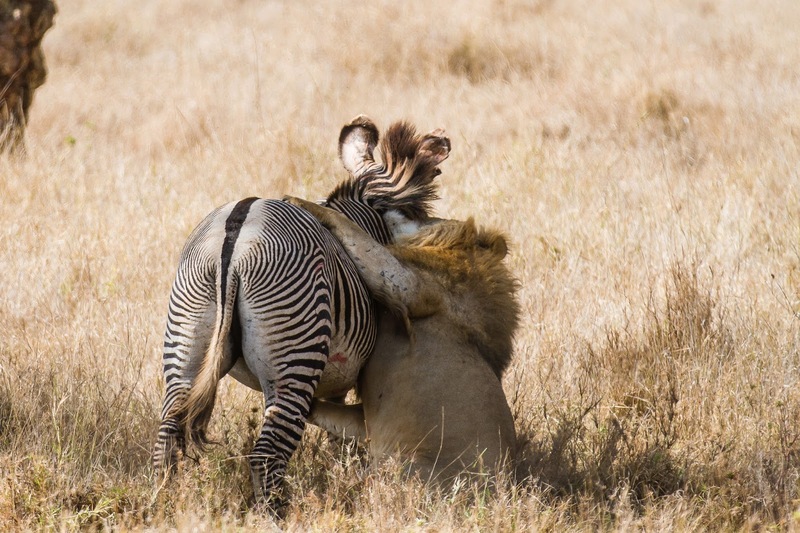 The lion lifted his head to pant and almost ironically it was only then that the waterbuck began snorting in alarm. 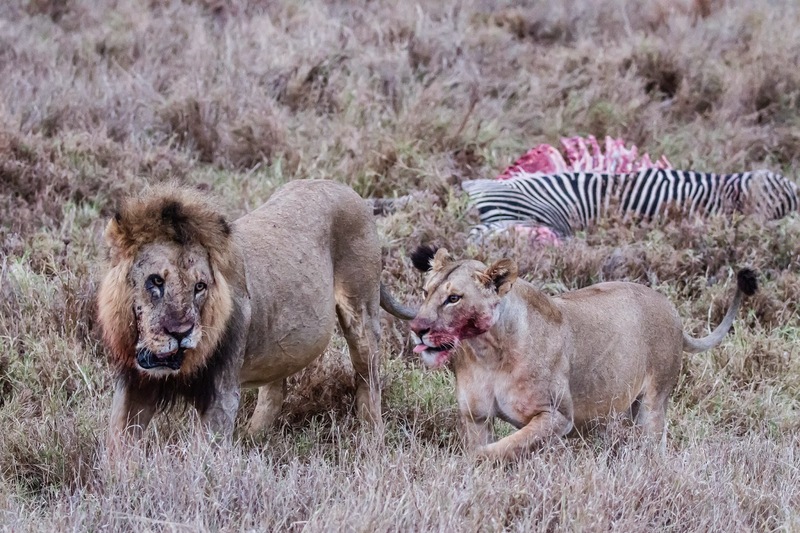 They and the surviving stallion were now gathered around the lion and his kill, keeping a good eye on the predator, ensuring he knew the element of surprise was gone, just in case he considered making another daring hunt! 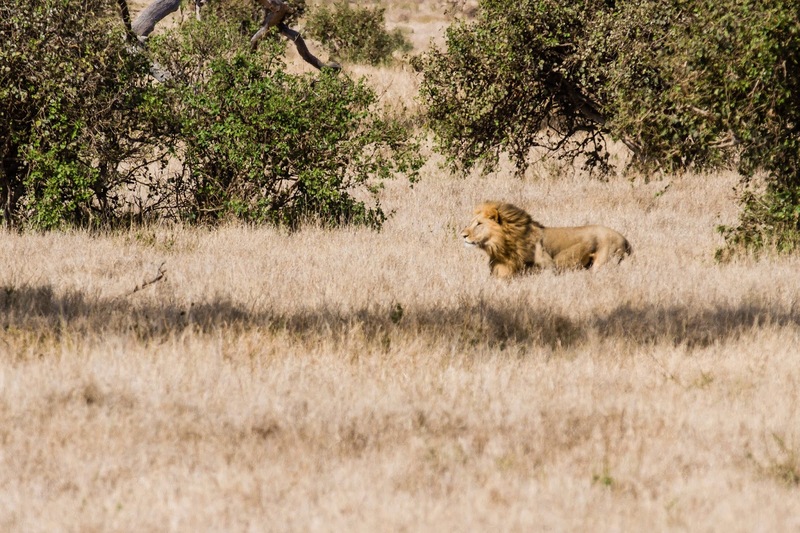 As the lion settled down to eat, our adrenaline levels began to settle as well. We could not believe what we had just witnessed. Everything you read and hear about lion hunts didn’t seem to apply here. 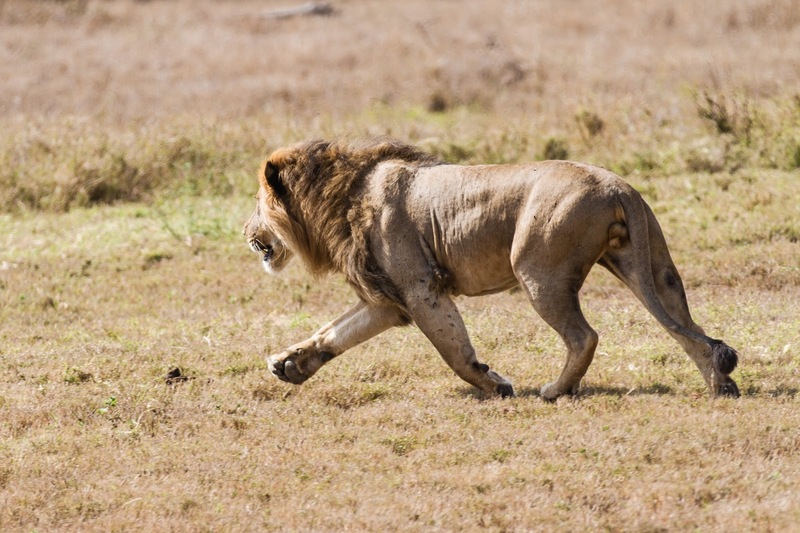 We already knew that male lions have a false reputation for being lazy and over reliant on hunting lionesses. But a lone hunt in broad, hot, daylight, over a distance of 300m to take on a formidable 450kg Grevy’s Zebra stallion…the sheer audacity! We returned to the scene for the next three days. The following morning the male had been joined by two more lions - a gruff, but much larger black-maned lion, and a young female. 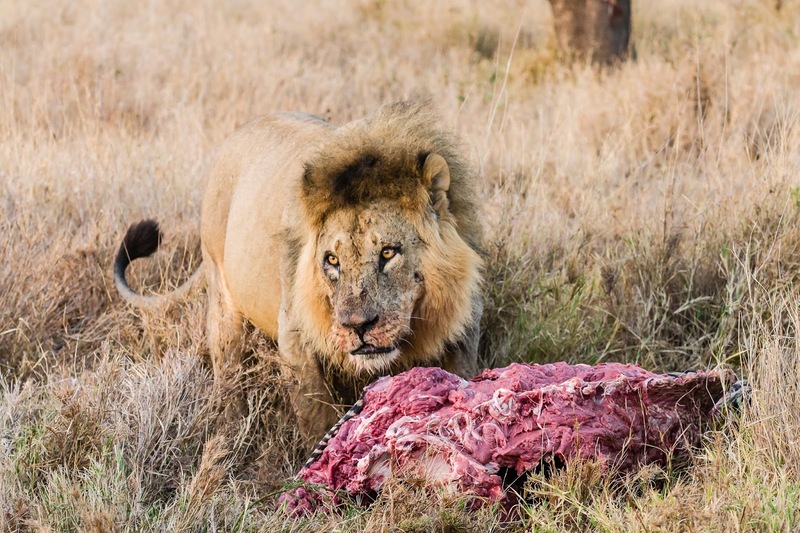 This older lion had a heavy limp but still dominated the kill. He refused to let the blonde male near the carcass or the female. Eventually the female headed for the swamp for a drink. The old male growled in protest, carefully following her, ensuring he kept between her and the blonde male until they reached and disappeared into the reeds. The blonde male took his chance to resume feeding. Despite the amazing events we had the privilege to witness, we were able to appreciate another context to the kill. Grevy’s Zebras are critically endangered, with numbers hovering around 3000 left in the wild. Conflict with pastoralist communities is thought to have reduced their numbers from 15,000 in the 1970’s. With the Ethiopian sub-population threatening to go extinct in the coming years, Grevy’s Zebras will become endemic to northern Kenya. 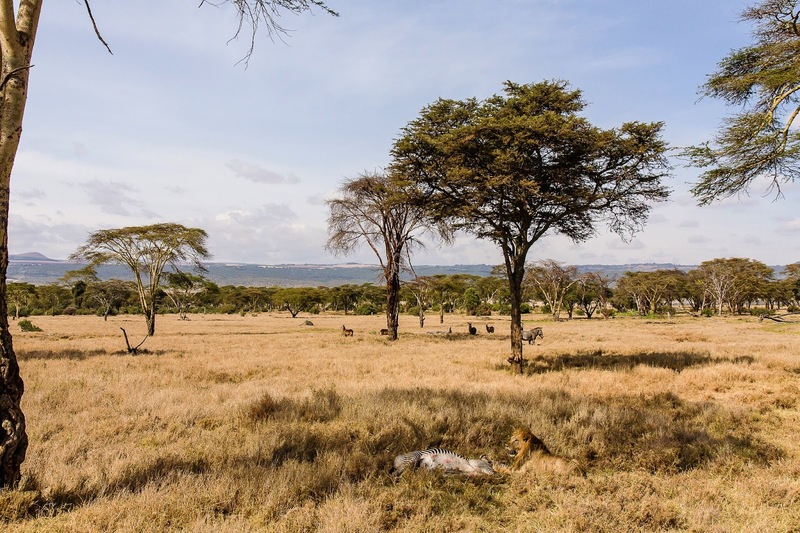 Conservancies such as Lewa, its Laikipia neighbours and its partners in the Northern Rangelands Trust are the last strongholds. 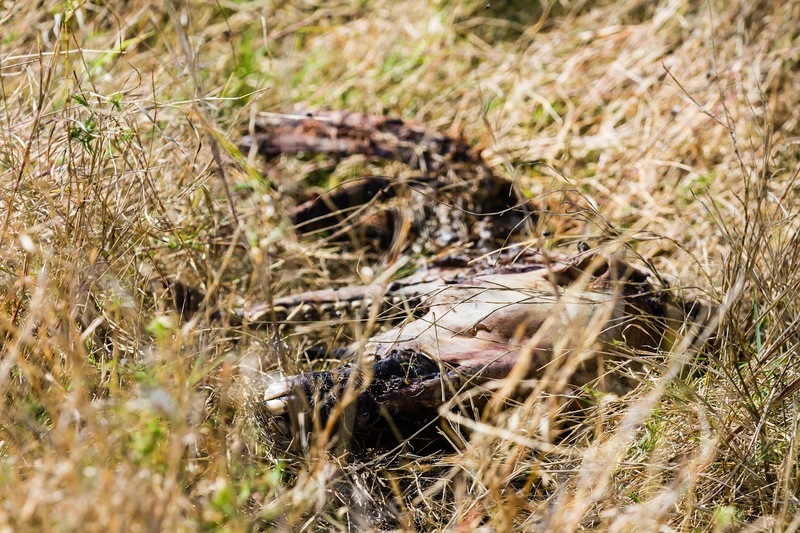 As conflict with pastoralists is minimized by adopting better grazing policies, the current main threat is predation from lions and spotted hyaenas (Crocuta crocuta). A seemingly disproportionate number of Grevy’s Zebras are predated considering their relative scarcity to other prey, but it is usually the foals that get taken. To have a healthy stallion killed will be a blow to Lewa, which holds around 11% of the global population. 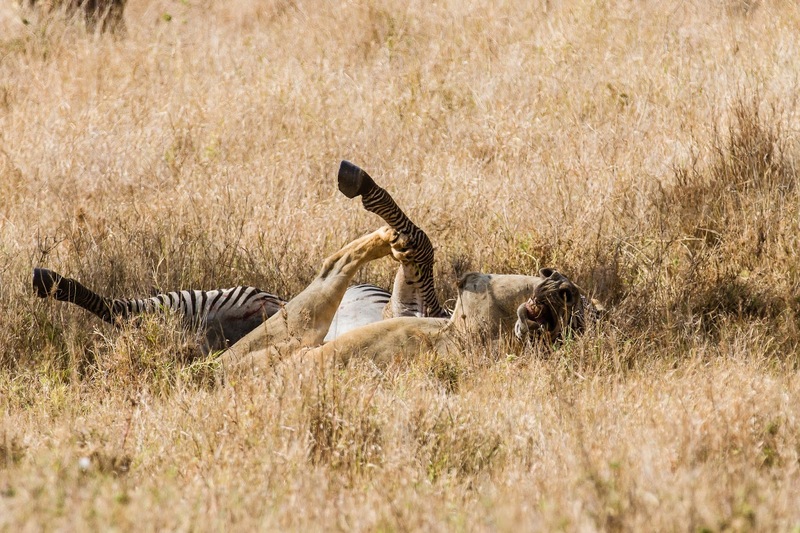 However, the current emphasis on maintaining a functioning ecosystem involves the risk of losing a number of critically endangered animals to predation, be it Grevy’s Zebras or even Black Rhino (Diceros bicornis michaeli) calves. At least these photographs and our report can contribute to the ongoing research into these dynamics.